T.B. Walker, Minneapolis, by 1925; T.B. Walker Foundation, Minneapolis; gift 1976 to the Walker Art Center, Minneapolis; (sale, Sotheby's, New York, 24 May 1989, no. 36); Mr. and Mrs. Jack Kay, Chevy Chase, Maryland; gift 2002 to NGA. The painting was sold by the Walker Art Center to establish a purchase fund for contemporary art in the name of the donor, the T.B. Walker Foundation. George Inness: An American Landscape Painter, 1825-1894, George Walter Vincent Smith Art Gallery, Springfield, Massachusetts; Brooklyn Museum; Montclair Art Museum, 1946, no. 19, repro. American Landscape Painters, 1800-1960, Norfolk Museum of Arts and Sciences, 1961, repro. A Retrospective Exhibition of Paintings by George Inness, The Paine Art Center, Oshkosh, Wisconsin, 1962, no. 13, repro. American Landscape: A Changing Frontier, National Collection of Fine Arts, Washington, D.C., 1966, unnumbered catalogue. Brush and Pencil IX, no. 2 (November 1901): 75, repro. Brush and Pencil XVIII, no. 4 (October 1906): 146, repro. The Walker Art Galleries Catalogue. Minneapolis, 1927: 85. Index of Twentieth Century Artists IV, no. 3 (December 1936): 354, 361. Cikovsky, Jr., Nicolai. "The Life and Work of George Inness." Ph.D. dissertation, Harvard University, Cambridge, Massachusetts, 1965: fig. 50. Ireland, Leroy. The Works of George Inness: An Illustrated Catalogue Raisonné. Austin and London, 1965: no. 387, repro. 97. Cikovsky, Jr., Nicolai. George Inness. New York, Washington, D.C., and London, 1971: fig. 34. 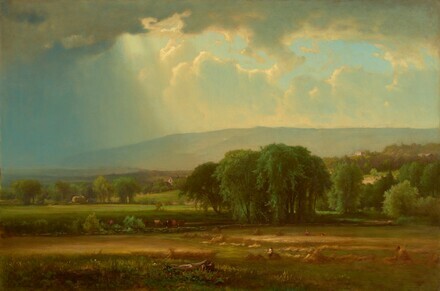 The Romantic Vision: 19th Century American Landscape Painting in the Walker Art Center Permanent Collection. Minneapolis, 1978: 18-19, 32, fig. 14.